.................. summer is on it's way!! 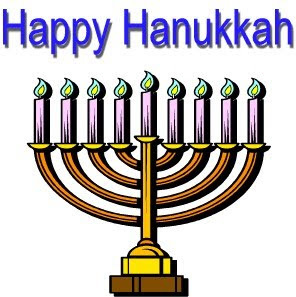 Today is the shortest day of the year - so they get longer from now on! Roll on Summer!!!! 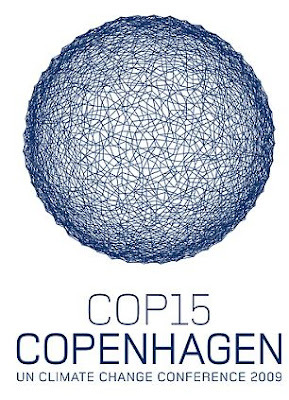 With three days to go, the crucial Copenhagen summit is failing. Tomorrow, the world's leaders arrive for an unprecedented 60 hours of direct negotiations. Experts agree that without a tidal wave of public pressure for a deal, the summit will not stop catastrophic global warming of 2 degrees. Click below to sign the petition for a real deal in Copenhagen -- the campaign already has a staggering 10 million supporters - let's make it the largest petition in history in the next 72 hours! Every single name is actually being read out at the summit -- sign on at the link below and forward this email to everyone! An Avaaz team is meeting daily with negotiators inside the summit who will organize a spectacular petition delivery to world leaders as they arrive, building a giant wall of boxes of names and reading out the names of every person who signs. With the largest petition in history, leaders will have no doubt that the whole world is watching. “We marched in Berlin, and the wall fell. "We marched for South Africa, and apartheid fell. Copenhagen is seeking the biggest mandate in history to stop the greatest threat humanity has ever faced. History will be made in the next few days. How will our children remember this moment? Please Leabank Square let's tell them we did all we could. My Wheels Have Been Nicked!! Help!! Earlier today some toe-rag gained entrance to the communal stairwell and nicked my wheels. I know in the scheme of things in Leabank Square at the moment - this is nothing. But as someone who cycles to and from work every day - this is going to have some impact. Of course I'll be able to save up and replace it. But guess what - this is my 4th bike to have been stolen here in Leabank Square in 10 years. Is that about average for london? 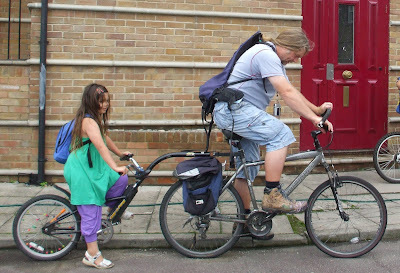 Anyhow - if any of you are offered a Claud Butler 700s grey men's bike with a child's tag-a-long attachment still on the seat post - please get in touch with me. Oh yes - they decided the panniers weren't cool enough - and left them for me - so just look out for the bike - with front & back lights. Thanks. Okay - so I know not everyone has heard of it - but believe me when I say that this award is very sort after by all gardeners who blog. Besides being the largest international garden website, they actively seek out bloggers who make a difference to their communities through blogging. And last night Shiela got in touch to say that we'd won the award for this month!! Please check them out to see what worthy company we keep! 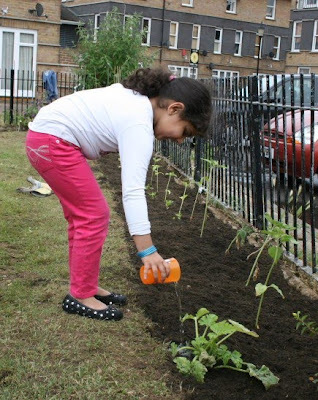 So well done to all the Leabank Square Gardening Club (like Aamna above) - and everyone who nominated us. Together we really can make Leabank Square a much better place to live! Yeah - I know it's a crappy shot - but until a very generous reader donates a digital SLR to us - this is the calibre of photo you get! Aaaaaaaanyway - if you squint just the right amount - you should just be able to make the halfish moon out through the cranes of the Olympic athletes village. Eric Man Hon Luk - who runs the excellent Hackney Wick Festival -has told me that there are still some stall spaces left in the Xmas Special on the 19th December. I know that some of you are already signed up - but if anyone else has any unwanted goods lying around their home - or stuck up in the attic - now is the time to get some extra Xmas dosh. Also - please put this date down in your diaries - and come down to the Flea Market in old Carpenters Road - next to the big blue Olympic gate - you'll be sure to buy some amazing Xmas pressies. Leabank Square Art goes up in Olympic Park! 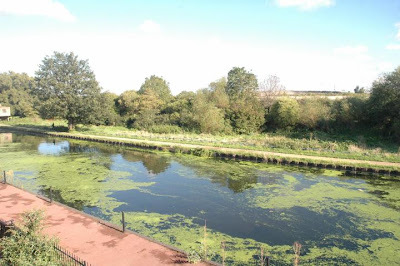 A massive thanks to Gemma (Senior Community Relations Executive from the ODA) and Carrillion for making our view over the canal a lot more pleasing to the eye! During the summer, one of their photographers visited our gardens and snapped these lovely pictures. Of course the best one was of Lucy's garden - which was naturally the best garden in all of Leabank Square. They have now magically pasted the portakabins with these images. So we will have reminders of summer all the way through the chilly months to come. Gemma - we all know how many challenges you faced getting this project completed - so we doubly appreciate the dedication and commitment you showed making our lives that much better. Thank you! Fantastic Olympic Festive Lights for Leabank Square! At exactly 4.30pm today, Juran & Dwain switched on the festive lights across the canal on the trees outside the portakabins! They were supported by fans on this side up on the riverbank giving them a countdown. Proud mums Z & Jade were among the crowd to cheer them on from the Riverbank Garden & Nursery. Thanks to Tracie (chair of the LSCA) and Gemma (Senior Community Relations Executive ODA) for organising this lovely gesture from Carrillion over the festive season! 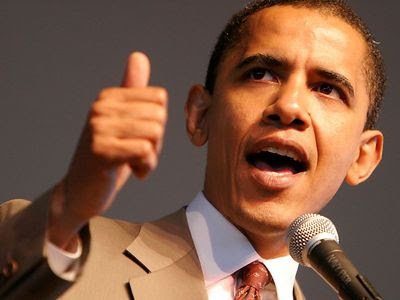 Barack Obama to visit Leabank Square? Hi from Leabank Square in Hackney Wick, east London in the UK!! You probably did not see it - as you were so busy running your election campaign – but last year we sent you an invitation to visit Leabank Square while you attend the 2012 London Olympic Opening Ceremony! You see – we knew you would win (http://leabanksquare.blogspot.com/2008/10/dear-barack-obama.html) – and were so thrilled at your success that we had an inauguration barbie in your honour (http://leabanksquare.blogspot.com/2009/01/barack-obama-inauguration-barbie-in.html)! Leabank Square is the closest residential neighbourhood estate to the London Olympic Park – but it is also situated in one of the most deprived boroughs of the UK. Hackney has its fair share of challenges – and most of the residents are doing their best to meet them. In many ways it’s similar to the Chicago of your youth. The one huge similarity is how social deprivation affects young kids. Unfortunately – we have many kids who are in great need of more motivation - in order to best meet their full potential. This was behind the invitation we extended to you Mr President. We thought – that as you were just a few metres away from our estate – you might see your way to paying our kids a visit? You have no idea what that would do for the morale of our children! There is no child on this planet that could ever do the opposite of a few inspirational words from President Barack Obama! Obviously you are the busiest person around – so if you can’t make it – no worries. But if you could see you way to spending an hour in our estates garden chatting to some of the residents children – please PLEASE do let us know. I’m never sure how world leaders decide whether to come to the opening or closing ceremonies – I think it has something to do with how many medals they have won – but if at any stage you have a spare hour while you’re in our neck of the woods – please know that you’re very welcome to pop by. Flytipping Hits Leabank Square Again!! We've had another wave of flytipping in & around our lovely square. I know we would never do this to ourselves. Nobody would ever do this to themselves & neighbours. So please keep an eye open for the so-called 'rag&bone' people who are doing this. They get paid to pick up trash & household rubbish - particularly after a decoration - and are supposed to dump it legitimately. But what I personally (and a few other residents) have seen is - that while they trawl the estates looking for 'scrap metal' (incidentally - all our 1st garden tools were also classified as 'scrap metal' - straight out of the storage cupboard) - they casually dump any unwanted junk from their paid journey here. Of course - this means that they never ever get to the council dump, but merely spread this junk all along their trawling route. I have managed to get rid of most of this latest fly-tipped rubbish (thanks Tom) legitimately - but please keep an eye on these vans that come around. The police have advised us to try and sneak a few photos of them in action - and pass them on to Sgt Port. Come on Leabank Square! Let's start taking more control of our environment by not allowing this horrible fly-tipping!